One of my questions about Amish life was "can the the Amish and English be friends? I always imagined myself living next door to an Amish family and becoming friends with the grandmother next door. 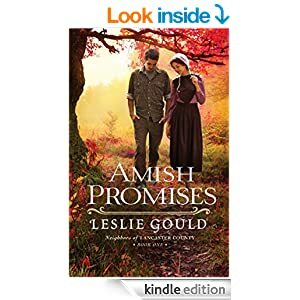 In this beautifully written story Leslie Gould lets us explore that very possibility. I came to care about each family as they deal with the circumstances that happened in their lives. The author reminded me as I read that we all have the same kind of problems no matter who we are....anger, hurt, love, loneliness, We have to deal with those issues but yet at the same time not dwell in them. We have to take time to care about our neighbors. I couldn't pick just one favorite character from the book. Both Shani (English) and Eve (Amish) both stood out for me as strong women who are caring and hardworking. A great read that will keep you wondering what happens next!